TUCSON, Ariz. and ORLANDO, Fla., April 3, 2014 — A long-range femtosecond laser under development could be used to steer lightning away from buildings. Optical scientists at the University of Arizona and the University of Central Florida are working on the technology, which uses a low-intensity laser beam to surround and give greater coherence to a high-intensity beam. The resulting filament would leave a channel of plasma in its wake that could be used as a path of least resistance to attract and channel lightning bolts. In the top image, a laser beam is focused and a short filament results, leaving a rapidly dissipating plasma channel. In the bottom image, the beam is accompanied by the dress beam, which extends the filament and plasma channel. Courtesy of the University of Arizona. According to the National Fire Protection Association, lightning strikes caused an annual average of $407 million in property damage from 2004 to 2008. There were 23 lightning-related fatalities in the US in 2013, according to the National Weather Service. Due to diffraction, current high-intensity lasers essentially disappear over distances greater than several feet when focused tightly. The new laser’s secondary beam effectively refuels the primary beam, sustaining it over much greater distances than were previously achievable. 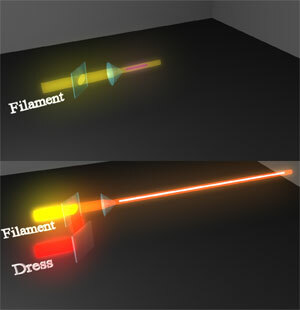 In the lab, the researchers were able to extend the range of filament lasers from about 10 inches to 7 feet. Simulations performed by Matthew Mills at the University of Central Florida have shown that by scaling the new laser technology to atmospheric proportions, the range of the laser filaments could reach 50 meters (165 feet) or more. "Think of two airplanes flying together, a small fighter jet accompanied by a large tanker," said Maik Scheller, an assistant research professor in the UA College of Optical Sciences, and lead researcher. "Just like the large plane refuels the fighter jet in flight and greatly extends its range, our primary, high-intensity laser pulse is accompanied by a second laser pulse — the ‘dress’ beam — which provides a constant energy supply to compensate for the energy loss of the primary laser beam as it travels farther from its source." The development of the new technology was supported by a five-year, $7.5 million US Department of Defense grant awarded to a group of researchers led by Jerome Moloney, a University of Arizona mathematics and optical sciences professor. Moloney is heading up the multidisciplinary, multi-institution research effort to investigate ultra-short laser pulses, focusing on their effects in the atmosphere and ways to improve their propagation over many kilometers. Improved understanding of the pulses would create the groundwork for a new class of robust laser beams that are more effective in overcoming scattering caused by atmospheric turbulence, water droplets in clouds, mist and rain, according to Moloney. Such beams could be used in detection systems reaching over long distances. The work is published in Nature Photonics (doi: 10.1038/nphoton.2014.47). As a wavefront of light passes by an opaque edge or through an opening, secondary weaker wavefronts are generated, apparently originating at that edge. These secondary wavefronts will interfere with the primary wavefront as well as with each other to form various diffraction patterns. Attochron, LLC is the exclusive developer of this technology for wireless telecommunications and utility power beaming.